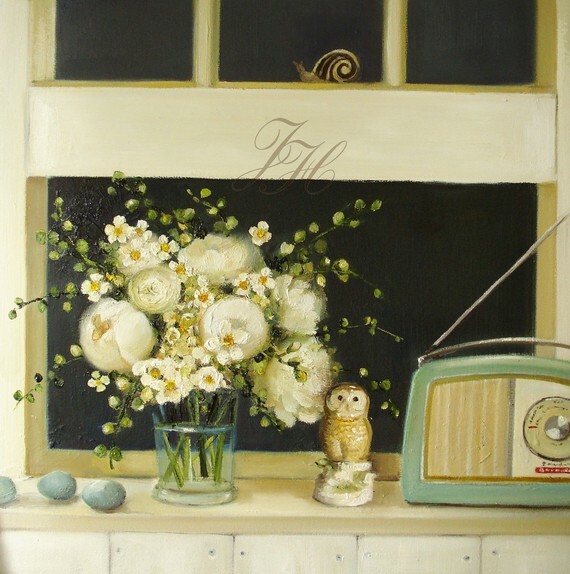 Completely in love with Janet Hill’s work this snowy morning and wanted to share with you! My absolute favorite! 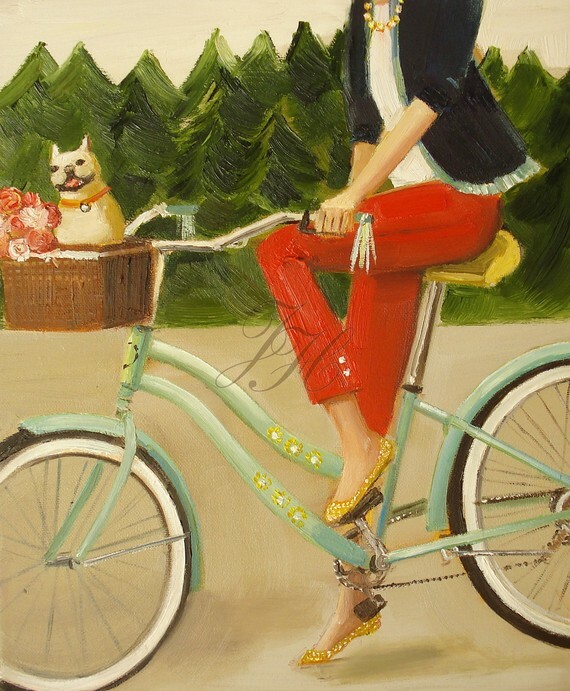 Brings together my love of frog dogs, ballet flats, red/navy, pearls, and bicycles with baskets! J’adore! 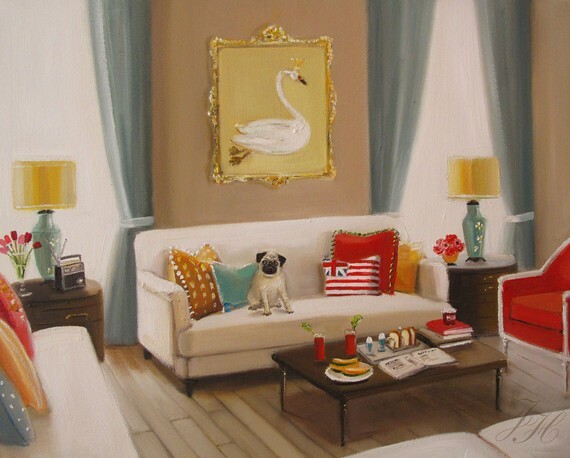 A pug, bloody marys, gold baroque frame with a picture of a swan, the union jack, polka dots, tulips, use of red and turquoise: it almost like this is a picture of the inside of my brain! 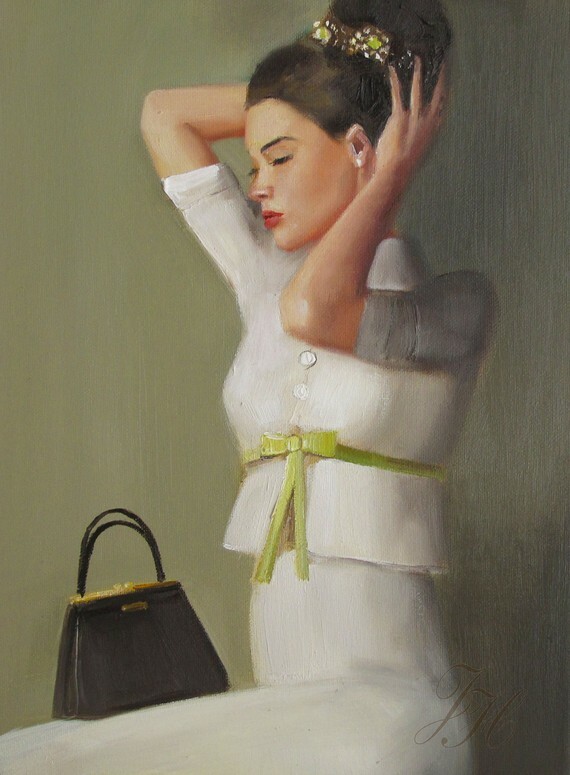 Janet Hill’s ladylike prints will be an excellent addition to the walls of my new-for-spring apartment (which I promise I will discuss in fuller detail as the project takes shape). While I hope that I don’t regret sharing this beautiful artwork (she seems to only have a few of each print – time to buy! 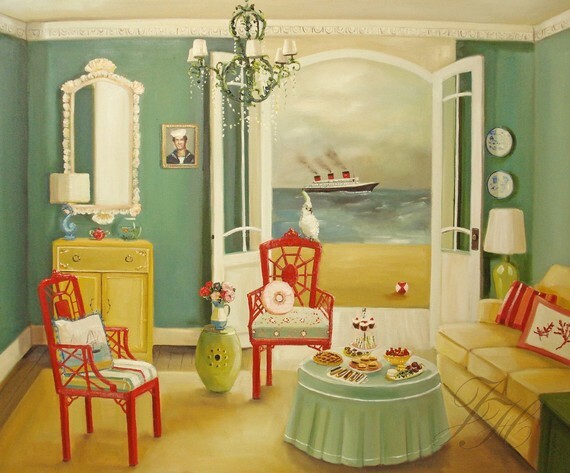 ), I simply adore the attention to detail and her knack for picking subject matter that appeals to my idiosyncratic taste and using color palettes that have me rushing to paint my walls. Add to that the fact that her prints on her etsy store are not exceptionally expensive (ranging from $55 to $17). If you find that is a bit too spendy, her work is also available in card form (on her etsy INK store) which can look just as lovely when placed in a frame. Don’t be surprised if you see some of these lovely images on my walls, cherie! And do drop by Janet’s blog when you have a moment! That’s funny – there’s a J. Hill Design Studio in Boston. Very different stuff, though. Absolutely love these pieces! Especially the first one, adore the flats! I love these! They are so vibrant and frilly with just the right amount of whimsy and class shaken in together. I am surprised Kate Spade hasn’t tapped her for an ad campaign. I am so in love! I also love her story – taking a leap and just painting full time, no “day job.” Inspiring! I am having such a hard time deciding among all of the beautiful prints, but I think that Francine and Saturday Morning are definitely headed for ownership. You are currently reading Quite Continental Loves: Janet Hill Studio at Quite Continental.